One of the services provided by the Shaping Spaces Group is home re-design. 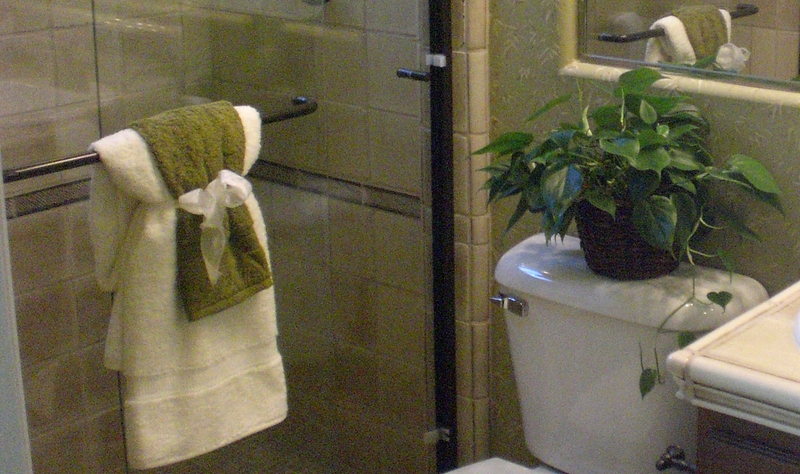 When redesigning a home we help clients revamp and use items they already own in new ways. Here are a few ways we have brought new life to ordinary bath and hand towels. 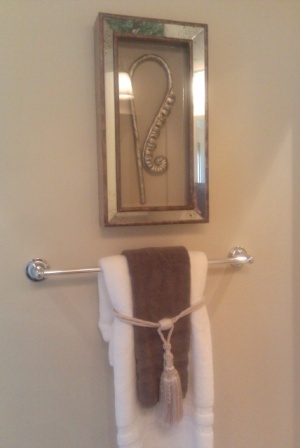 3 simple ways to dress up boring bath towels with “everyday” items. 1. 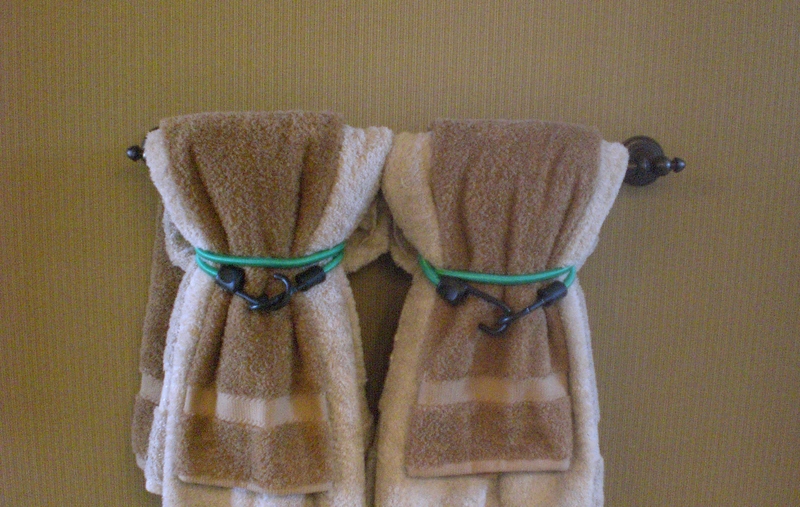 Use left over ribbon from the holidays or birthday to give those towels a new life. 2. That’s right bungee cord, can become glamorous too to add that designer masculine touch. 3. Tie backs aren’t just for drapes you know. 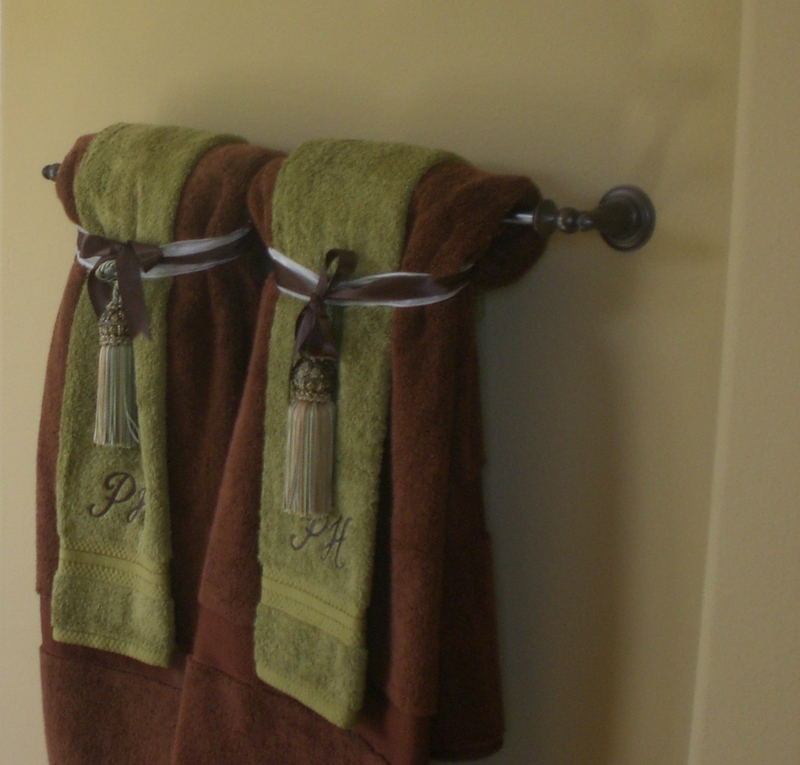 Switch it up and put your drapery accessories on your bath towels for a regal statement. Great tiebacks can be found at Bed Bath & Beyond, TJ Maxx or most home decor stores. Try to Re-purpose before you Trash it? Can I Re-purpose It? Before I Trash It! I’m all about helping my clients find new ways to reuse or revitalize items in their home, either by re-upholstery, painting, staining, or using it in a different way. Here are two examples of what I did in my own home. I turned two awesome little iron tables into works of art. A friend of mine had these great black metal tables (pricy little suckers), will they got left outside after a dinner party and it rained on them for days. After sitting outside for weeks of course they rusted and turned orange looks terrible, she was going to toss them out, I said “wait I’ll take them, I love those tables”, said go ahead they are all rusty from the rain. I took the tables got most of the rust off the legs, but the rest I decided to embrace the rust and encapsulate it by poring resin on top to create a hard surface like a bar top. Brushed the rest of the tables with the resin to seal in the color, and presto new tables that everyone loves cause of the unique color and design…By the way MY friend wanted them back. Another thing I just did was repurposing my sons’ toy box. He no longer needed a toy box in his room but it is a great red fire engine shaped toy box on wheels. His new “Big Boy” room theme is cars, motorcycles, etc… I decided to use the toy box as his new dirty cloths hamper, it fit theme and looks great with his red drapes. No more toy box or ugly clothes hamper to try to hide. So the next time you are going through item to get rid of that you just love, try to thin of creative ways to reuse the item or revitalize it so you can keep it around to enjoy in addition to saving the environment by recycling. Happy Designing. WHAT HAVE YOU REPUROPSED LATLEY?